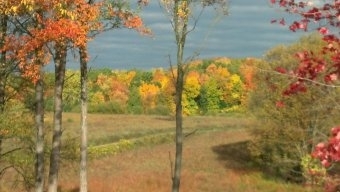 Colonial Farms, LLC is a Michigan Limited Liability Company. 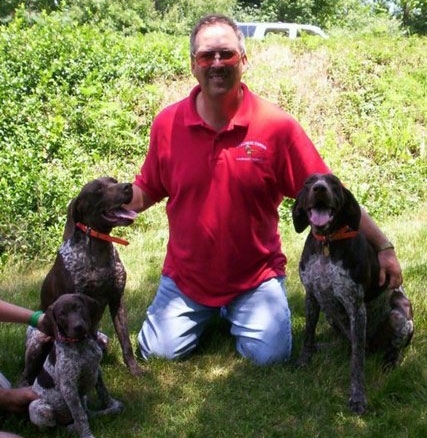 In 2005, we started our small Ma and Pa family-owned business with 3 divisions - Field Dog Training, Gamebird Preserve and German Shorthaired Pointers. IMPORTANT NOTICE: As of 2018, we are NO LONGER offering GAMEBIRD "HUNTS" on our Preserve. We also are NO LONGER BREEDING GSP's. We are not able to work 7 days a week due to our parent care-taking responsibilities, which is our PRIORITY for the upcoming years. Therefore, we have decided that we are NO LONGER WORKING WEEKENDS. Bill will continue to TRAIN with YOU and your dog(s) in the fields with live birds YEAR-ROUND. We offer Private Field Training Lessons Monday-Thursday (SUN-UP to SUN-DOWN). Due to the high demand, we do usually sell out weeks in advance. Please reserve your lessons in advance so that you are able to continue building on your training as the skills progress. Private Field Training Lessons with your bird dog on live birds is suggested at least monthly and more often while gun breaking. Thank you so much for your understanding as we move on to another chapter of our lives together. Through the DNR, we have a licensed gamebird preserve for your year-round private dog training lessons. We are blessed to be able to share our family-owned 100 acres of beautiful rolling terrain for your training needs. NEWSFLASH: As of the 2018 summer season, we are NO LONGER OFFERING PRIVATE HUNTS due to the demands and flexibility needed for our PARENT CARE TAKING ROLES in the Dearborn area. We will however, continue to offer Chukar Partridge and some Pheasant for your YEAR-ROUND Bird Dog Training needs. Many hunters and competition dog owners love the convenience of our unique terrain to train privately with Bill and their dogs on live birds year-round. Training on live birds allows owners to keep their dogs fine tuned for the future hunting season or competition events. Bill offers Private Field Training Lessons for you and your bird dog one-on-one to help you bring out the best in your hunting partner. With private lessons and live birds, he will teach you how to train your gun dog in short simple lessons while at your home in between visits at our preserve. No commitments are necessary and you may come as little or as often as you prefer to train your dog year-round. Bill is always available with the training equipment and live birds to help you work on problems if they develop in the future. 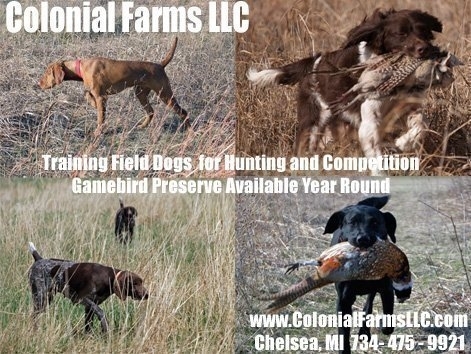 We plan to carry Pheasant and Chukar Partridge for your bird dog training needs. Whether your gun dog is 3 months or 3 years old, Bill will help you develop your bird dog into what you desire at your convenience and while bonding with your four-legged partner for that close working relationship in the field for many years to come. IMPORTANT: As of January 2018, we are NO LONGER BREEDING GSPs. We enjoyed breeding German Shorthaired Pointers for 15 years. Unfortunately, due to PARENT CARE-TAKING ROLES for the upcoming years in the Dearborn area, we have decided that it was best to RETIRE as BREEDERS as of January 2018. Although the following GSP BREEDING information no longer applies, I will leave it on this website to allow others to see how we did things for the past 15 years. It may be helpful for comparison's sake when shopping for your next new GSP puppy. As lovers of the German Shorthaired Pointer breed, we personally own 6 GSPs here on our Gamebird Preserve. All of our dogs are great Upland Bird Hunters but they are also very smart, beautiful and have wonderful loving personalities, too. Their offspring have proven to have the same wonderful qualities throughout the years. Their bloodlines contain many Field Champions, Show Champions, Dual Champions, and National Champions. Although we no longer are breeding, the GSP has been a part of our family since 1993 and will continue to be ... forever!